I finished my month long residency on Friday. It was a large school with 500 students and I completed 2 projects with each class. This was one of the Grade 2 projects, spoon monsters. I know I could use a spoon monster by my stove! Here is some more student work. I only have a few photos as I'm still doing my glaze firing. For clay we work on top of canvas placemats. Each child gets a penny nail for cutting, a skewer for scoring and adding detail, and a small cup of water. I start off by giving each child a lump of clay approximately the same size. I get them to roll it between their hands or around the table to form a nice round shape. They are about the size of a large naval orange. The grade 2 students push their thumbs into the ball of clay and form a nice pinch pot. I talk to them about what a good thickness should be. (width of their thumb). I will go and check each one to make sure it's going to work before we move on to the next step. Take your 1/2 page of newspaper, crumple into a loose ball and stuff inside the pot. The newspaper helps the pot keep it's shape. I remove these before firing. Current school policy is to remove combustibles. In the past I have just let these burn off during the bisque fire. Take pot and turn onto it's side. Give it a few thumps on the table. This will flatten the side so it can stand up on it's side. I tell the kids if it wobbles try again. I give each child a smaller lump of clay and we start to add the features to our monsters. We attach clay by using our "scratch, scratch, water, water" chant. We use our skewer to score/scratch our clay and then dip our finger into the cup of water and add this to our scratches. I then tell the kids that the scratches have to KISS. An easy way to get them to remember despite all the 'eww gross' comments. I also tell them that 'short and stubby' is our friend. We don't want features that are to thin or tall on our monsters. Finally we scratch our names onto the bottom of the monsters. I drape the clay with plastic to equalize for a day or 2 and then allow it dry out for 1 - 2 weeks. I then bisque fire, we glaze, and I do the second fire. I had 3 grades completing clay projects during this residency. Here are some of the penguins from Grade 1. My full tutorial is here. and here are a sampling of the owls from Grade 4. My owl tutorial can be found here. Awesome work by all classes! Well I have to go prep for the start of another residency on Monday. I have lots more student work and new tutorials to add in the coming week. Occasionally here in Calgary we can see the Northern lights. This is the second project I'm working on with Kindergarten. I found this great youtube video for this technique from wecreate art lessons. I changed it a bit by adding some extra elements in the foreground to complete the composition. Cut a strip of watercolour paper the same width as your black construction paper. 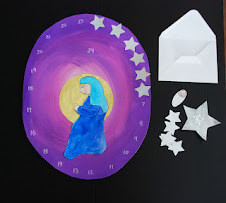 Paint with purple and blue disk tempera. While the paint is still wet lay a piece of plastic wrap on top. You want to smoosh it so that there are wrinkles in it. This creates the ice like texture. If yours is not working it might be too dry. Re wet with the water and try again. Leave plastic wrap in place while the paper dries. I want my trees to also have some texture so we used textured wallpaper from the hardware store. 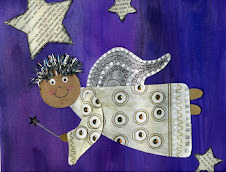 You could also pass some paper thru a crimper or embossing folder (cuttlebug). Paint with green acrylic or liquid tempera. We are using acrylic as tempera doesn't stick too the wallpaper. We then sponged on some black paint. I asked the students to not sponge too much so we could see both colours. Watch the video to get the technique down. I made quite a few stencils. If you cut your poster board or heavy paper in wide strips and then cut your wavy lines you get 2 stencils. Make sure your stencil is as long or longer than your background paper. Apply your chalk pastel along the stencil, we just followed the line. I asked the kids to choose bright colours. Use the kleenex and wipe upwards. I asked the kids to swap stencils for each new line. Continue all the way up the black construction paper. When the watercolour paper is dry remove the plastic wrap. Cut a curvy line from one side to the other. This will be the snow and ice in our foreground. When your textured paper is dry turn it over and draw some triangles on the back in different sizes. For the kinders I pre cut some animal silhouettes from the cricut for them. If I had more time, (another session) we would have drawn our own animals and added them to our nightscape. This is a project I'm currently working on with Grade 2. Valentine's Day is always a challenge for me in terms of art projects. I think it's because I feel locked into a heart theme as well as the traditional colour scheme. I have been doing Valentine inchies , (post 2) with Grade 2 for a few years now but this year I paired it with a lesson on warm/cool colours. I love teaching inchies as I can show kids lots of techniques in one project. These inchie hearts are also a great addition to the art journal. I'm using a lot of my painted paper scraps here. This background is a glue resist. You draw squiggles with white glue on the inchie background, let it dry and then paint over it with disk tempera or watercolour. Another interesting background is to dab on some waterproof ink, I used my PITT pen and then go over with disk tempera or watercolour. Now this is the materials list I used but inchies are meant to be done with what you have on hand. I sure you can make amazing "little works of art" with what you have in your stash. When I do inchies with a class we work on several at once. I'll give you the order of the steps I use at the end. But when I'm posting the directions it's easier for me to show you each inchie from start to finish. Out of a thin piece of cardboard draw a heart in pencil and then cut it out. My cardboard is roughly the same size as an inchie. 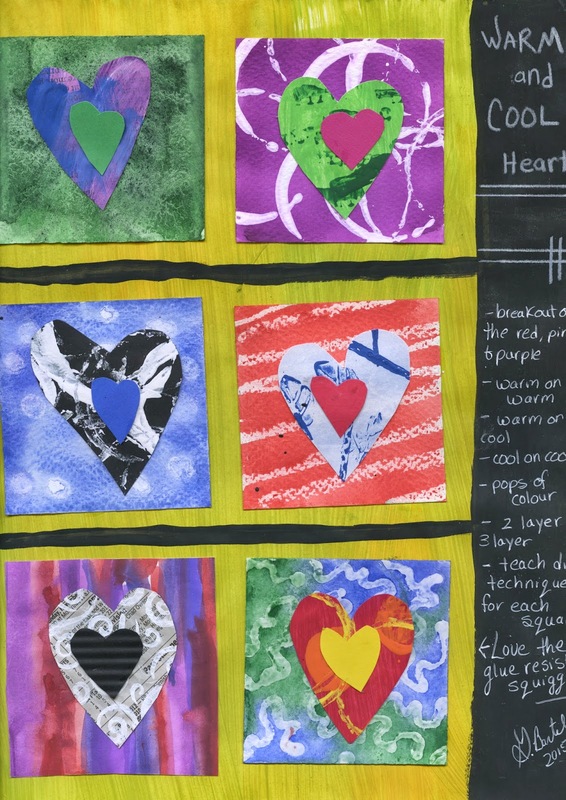 My biggest challenge with my students on this step is to get them to cut out a good sized heart and not a tiny one. Coat with a layer of drywall filler. Set aside to dry until the second session. Have the students paint the inchie background. They choose a warm or cool colour. For our purpose our warm colours are RED, ORANGE and YELLOW. Our cool colours are BLUE, GREEN, and PURPLE. Now purple can go either way depending on it's hue. Our purple at school leans towards the warm so a touch of blue helps. My square here is looking pretty warm. 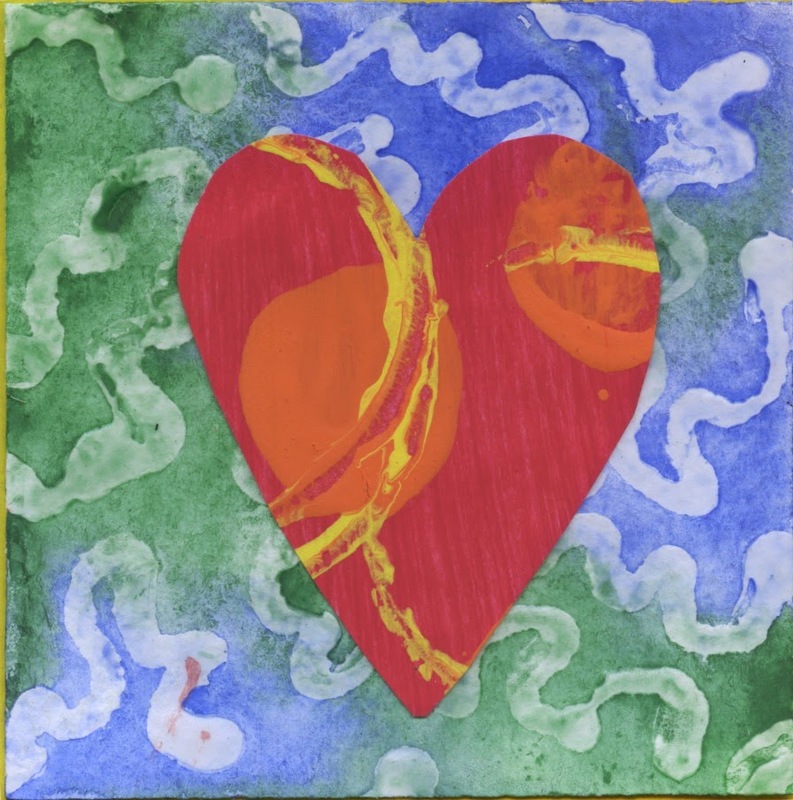 When the drywall has dried, (second session) paint the heart with acrylic or liquid tempera. and a little card stock heart. Paint inchie background either warm or cool. While paint is still wet lay on a piece of bubble wrap and press down. Leave in place until paint dries. On a scrap of white paper have students make a pattern using pencil crayons. Cut a heart out of that patterned paper. Add a small card stock heart. Paint your inchie with 2 or 3 warm or cool colours. While paint is still wet lay on a piece of plastic wrap and scrunch it a bit to make wrinkles. Leave on until paint dries. Take a piece of textured paper, (I'm using textured wall paper) and paint. 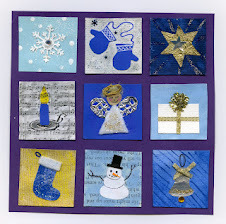 You could also use sand paperer paper you run thru a crimper or cuttlebug with an embossing folder. I'm using acrylic because tempera won't stick to the wallpaper. To show off the texture I dry brush on a little metallic paint. Cut a heart out of the textured paper and then a smaller one out of card stock. With oil pastels draw a design on the next inchie background. I ask students to ensure that some white is still showing. Paint on top of the oil pastel with watery disk tempera. 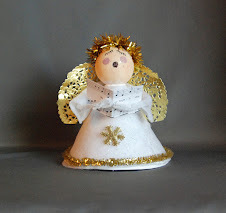 Glue onto inchie and then add small card stock heart. Paint inchie background either a warm or cool colour. Stencil on some paint to black card stock. Cut out heart shape from black card stock and then add small heart from felt or fabric. Out of a piece of contact paper cut a heart and stick to inchie. Paint with stripes right over top of contact paper. When paint dries peel off contact paper to reveal heart shape. I added a heart cut from silver wrapping paper and a small card stock one. Finally mount on black card stock. 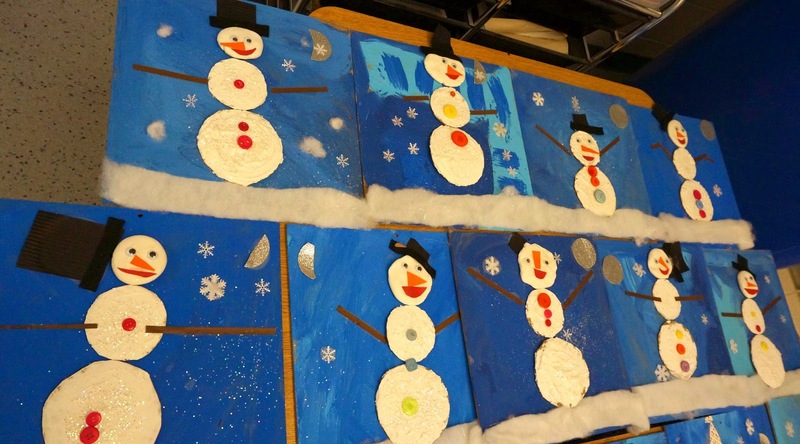 Here are some of the Kindergarten snowmen from the last post.